The NBA Style Guide is back helping you to get the looks of the league’s best dressed players courtesy of DressForTheDay.com and Extra Mustard. This week we take a look at Kobe retiring in style, and Carmelo Anthony’s luxury loungewear look. Be sure to download the Dress for the Day app for mobile fashion advice, or head to the men’s style section of their website to find the right look for any situation. 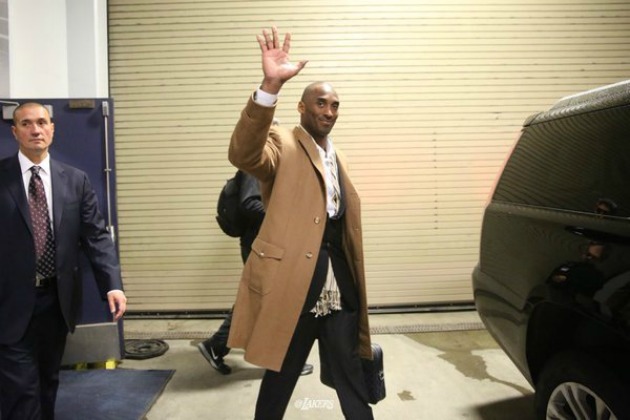 ​We’ve watched Kobe’s style evolve over the years and he’s certainly ending his final season in the NBA on a fashionably high note. He keeps it classic with contemporary touches and makes every single outfit so approachable. Starting with that show-stopper camel colored overcoat (similar here and here). Underneath, he sports a classic black suit and accessorizes with a neutral winter scarf. And of course his briefcase game has to be on point so make sure you grab one like his here. The man can do no wrong. With Anna Wintour as one of his all-time inspirations, do we perhaps see a post retirement jump to the fashion industry? 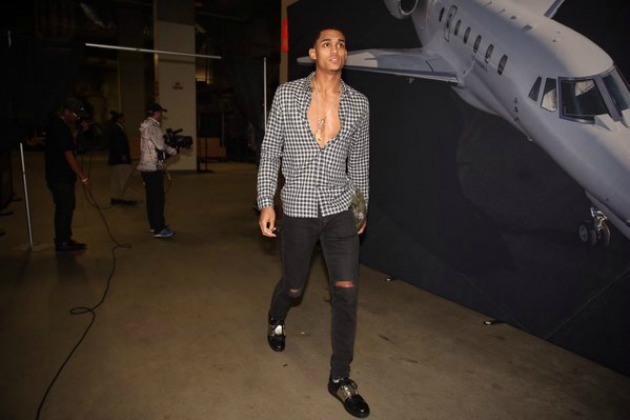 ​Sometimes you just gotta get dressed like YDGAF and Jordan Clarkson did just that. He wasn’t afraid to let a few buttons go during game day in Oakland and we are not complaining. We’re digging his checkered black and white button down, perfect for a night out or celebrating a win. Pair with some skinny black jeans like these or these for an edgy look. Finish up with some metallic two-tone oxfords (hello fashion statement) and don’t forget a little bling around the neck like this or this for an optimal chest exposure situation. Done and done. When you’ve scored front row seats at NYFW you’re no longer just a stylish NBA player, you’ve officially crossed over to being a fashion tastemaker. If there’s one thing we can take away from Melo regarding fashion, it’s that comfort is key. Our boy attended the show in sweats–yes, head to toe in a track suit. He kept the look subtle by opting for a neutral color like grey and then amped it up with a brimmed hat, camel coat (sensing a trend? ), and high top sneakers. 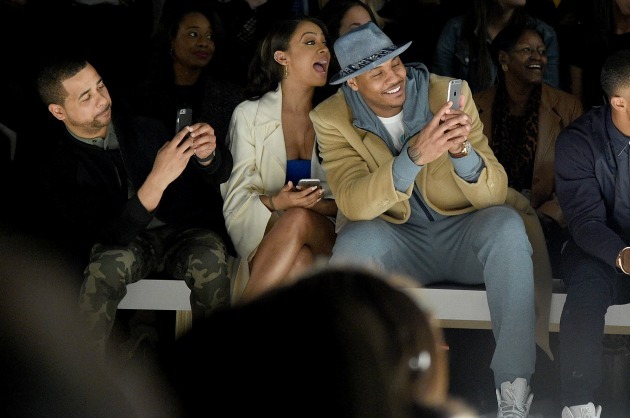 With fashion week around the corner, we’re keeping our eyes on Melo and that leisure sense of style. Raptors’ center J-Val has us eyeing his epic beard and classic sense of style in all the right ways. 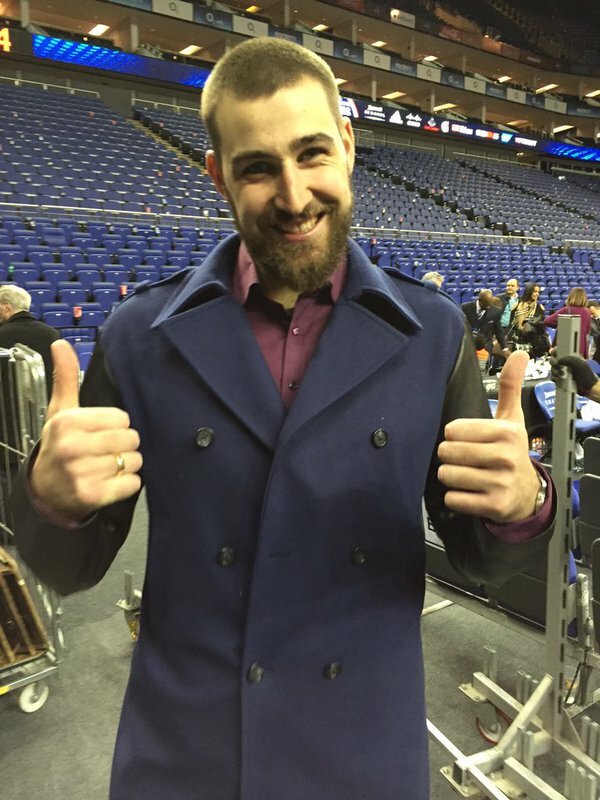 He’s all smiles in a traditional maroon button down paired with a contemporary peacoat in navy. For more winter coat style take a look here. We also know maintaining that glorious a beard is no easy task–enter subscription box experts, Birchbox to help you step-up your grooming game. Feel equipped to steal Jonas’s style? We’ll give that two thumbs up!